OK, this is quite a subjective topic, and can be one of much contemplation and discussion. I can tell you without bias that there are most definitely different levels of quality fabric to begin with. On top of that, the dying process differs, so sometimes you may have a stiffer fabric that looks deeply colored, but once washed it becomes soft and the color bleeds all over your other fabric. Some fabrics are made with threads already dyed, so they will give you less trouble. Let me begin by saying that if you shop at a craft store, you will get craft store quality fabric. If you shop at a sewing store, you will get better quality fabric. If you shop at a quilt shop, you will most definitely get THE BEST quality fabric available. Ever notice how expensive the fabric is in a quilt shop? THAT IS WHY! It tends to be higher thread count, new or prevalent lines and popular fabric designers. Don’t trust me? Go to the three types of stores and buy a fat quarter and test it out – feel it out. There will be a difference!! The source for their fabric is very reputable and you can often find it online, but online you can’t touch and see in person what you are looking at, which can make a difference if you need that particular color for a project. I have fabrics bought online that I love, and some that the color seems weird when it arrives and I’m not really sure what to do with it. But some online shops you will come to trust, knowing that they ALWAYS have fabric that is good thick quality, soft and supple. You’ll just have to ask around or order samples until you can be sure. The fabric I am showcasing below is what I believe to be high quality fabric, but brings another point to attention. Fabrics are dyed by different means; they have always been treated differently. Some you can tell by looking at the back of the fabric if the dye soaked through or the threads were dyed prior to weaving, if it was surface coated or how much of any pattern on the fabric is showing on the back. 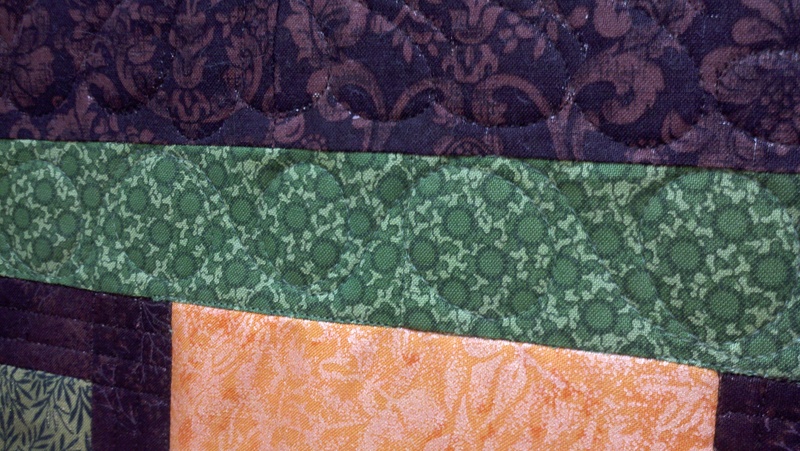 As an appraiser, oftentimes we look to the seams or any tears in the quilt for information on color fade – whatever is inside the seam will not have faded. 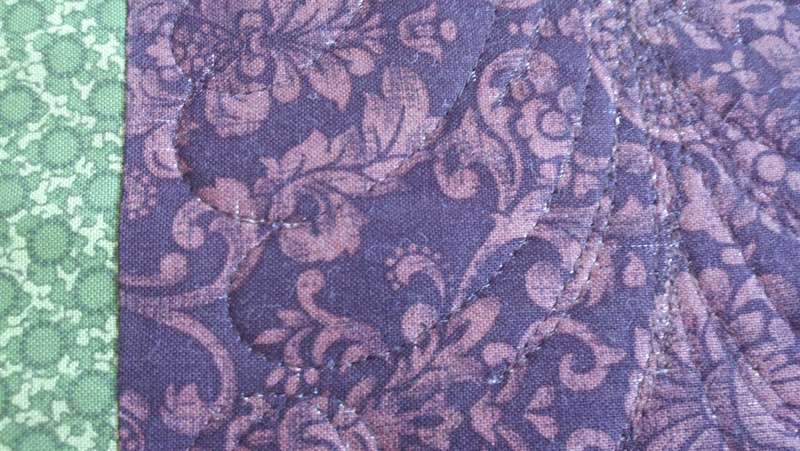 This particular fabric came to my attention when I began to quilt it, and the fabric seemed to pull. I changed my quilting needle, but the result continued. Once I looked at the back of the fabric I realized what was happening. The needle punched through the fabric as I quilted it, and when that happened, some of the threads in the fabric turned just a bit, causing the white of the undyed portion to show through on the top. It didn’t happen at all in the green, which was dyed through the fabric. 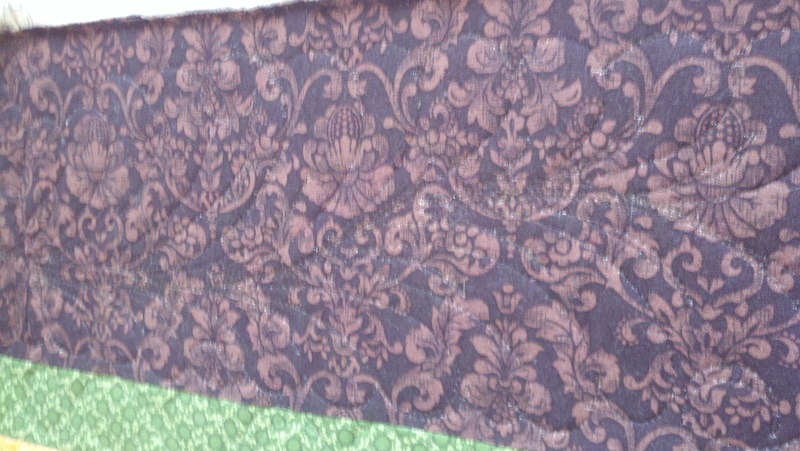 Once washed, this quilt top will probably tighten up and the white portion of the threads will become less noticable. 1. If your quilter returns a quilt to you that has white striations in a certain fabric, realize that it may just be due to the method by which the fabric was dyed. You can always ask if they used a new needle on your quilt (that answer should always be yes). 2. 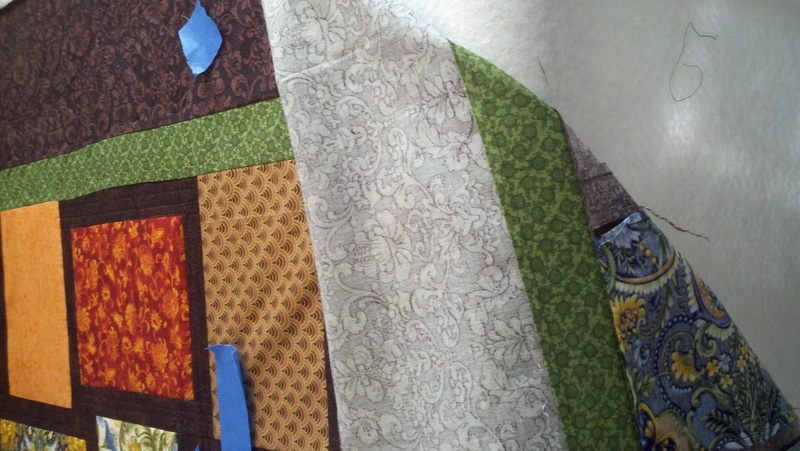 If you don’t want the possibility of this occurring in your quilt, check the fabric back prior to buying it.